The countdown is on for SC2, North Wales’ most exciting attraction, which is opening its doors to the public this Friday. Over the last 3 weeks, SC2 has welcomed over 5,000 local people to try the adventure centre for free ahead of the opening. Thousands of local people have experienced the thrilling slides of the waterpark and challenged themselves in the TAGactive arenas within SC2, and now it’s time to open the venue officially on April 5th. 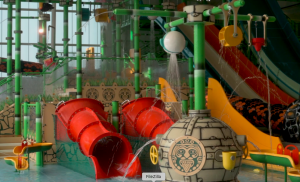 The £15 million waterpark includes Wales’ first TAGactive play arena, indoor and outdoor water play for all ages and abilities, flume rides, beach style paddling, feature slides and themed food outlets. There will also be a bar and terrace open seasonally. ALSO SEE Have you seen missing Glenda from Abergele ? As the centrepiece of Rhyl’s waterfront development programme, SC2 is expected to attract an extra 350,000 visitors per year to the town. SC2 has been funded by Denbighshire County Council with contributions from Rhyl Town Council and Welsh Government. Visitors can get all the latest information on the SC2 website http://www.sc2rhyl.co.uk and social media pages.